Driving through Goldsboro, abandoned, broken-down warehouses pass by. It’s a quiet drive, peaceful even. And yet the decaying buildings serve as a reflection, a reminder, of the difficult circumstances that many people struggle with in this city. According to US Census data, 24.6 percent of people in Goldsboro live in poverty, compared to 21 percent countywide and 16.8 percent statewide. In Wayne County, 37.6 percent of children live in poverty, and of the 34 counties served by the Food Bank, Wayne ranks as the 7th most in need. Near the middle of the city rests a quiet neighborhood with the W.A. 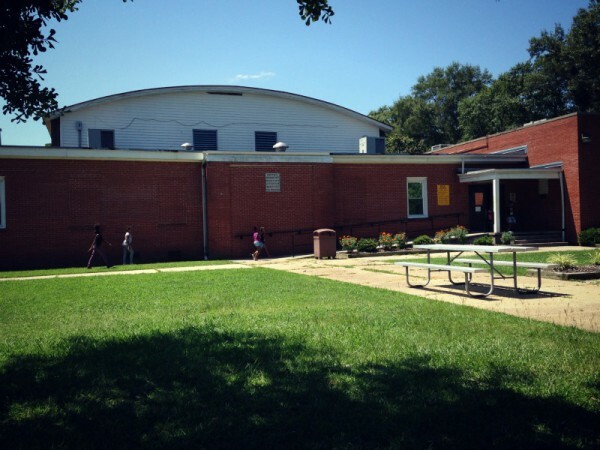 Foster Rec Center, a community center run by the city of Goldsboro, at its core. W.A. Foster is one of our summer feeding sites, serving kids breakfast and lunch Monday through Friday in a safe and positive space. At the site, there’s a gym and a recreation area complete with a couple of vintage arcade games and a ping-pong table. There’s a playground outside with swings and a big slide, and plenty of grassy, open space. It’s a sunny day and kids are running around in front of the building. They’re calling for their friends, telling them: It’s lunch time! Inside there’s a small cafeteria with enough tables and chairs for about 50 kids. At noon large serving dishes are set out on a long table, and within minutes of tinfoil being carefully peeled off of the trays, there’s a line out the door. Across our 34 counties, we monitor and support over 100 summer feeding sites. But only 10 of them are like this one, because this one serves hot meals. In Goldsboro, we administer six sites that serve hot lunches every day. This is made possible through a contract with K&W Cafeterias, a family owned, local restaurant chain which provides 420 hot meals to kids in need, five days a week. 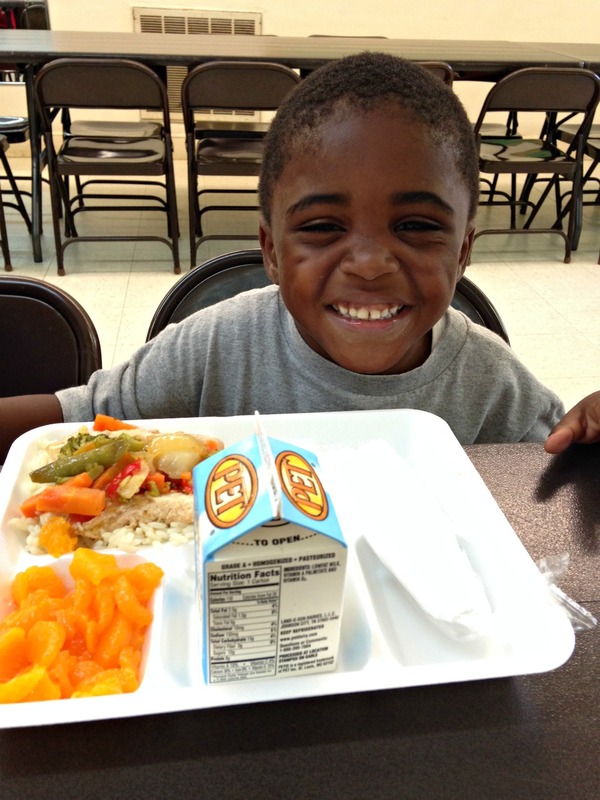 In our effort to continually improve upon meal service and quality, the Food Bank has contracted with K&W Cafeterias in Wayne County and Golden Corral in our Sandhills and Wilmington Branch service areas to pilot a unique service model to provide hot meals for our Kids Summer Meals Program. These partnerships allow the Food Bank to purchase these hot meals at a discounted price which will then be reimbursed by the USDA. And that is a big deal. 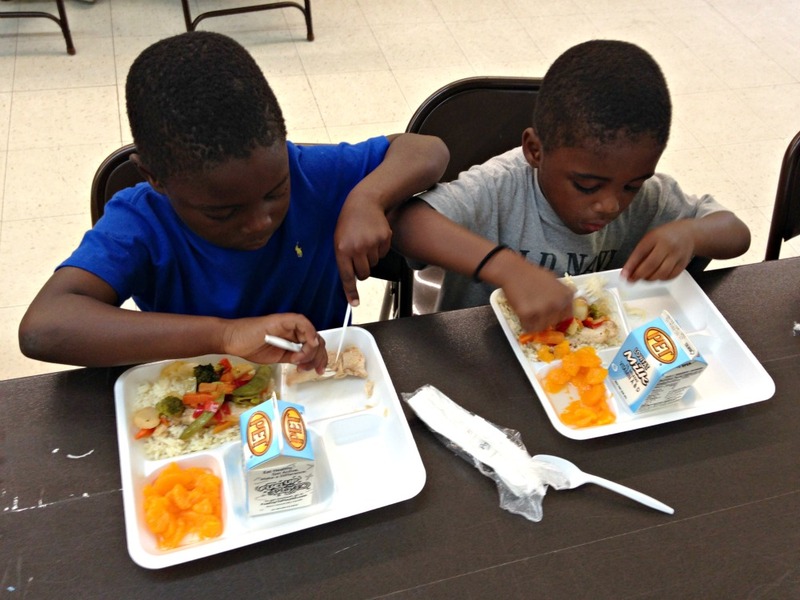 At the other 90 summer feeding sites, we provide meals that are easily distributed, stored and served to a large group of kids, which translates to a lot of cold sandwiches and fruit cups. These meals are filling and nutritious to be sure, but they lack something that makes these hot meals wildly popular: variety. One of the virtues of children, of course, is their sheer honesty. Toward the end of the summer, after almost three months of standard, ready-to-eat meals, the kids grow tired of the routine cold cuts. We work hard to make our job not just about feeding them lunch, but about enjoying their lunch, too. So we do our best to adjust the menus to provide food that the kids want to eat. But of course, there’s only so much we can do within strict nutritional guidelines, our capabilities and the capabilities of our partner agencies. The fact is, most of our sites simply don’t have the capacity to serve hot, freshly cooked meals to their kids every day. It requires a large kitchen and special certification from the North Carolina Department of Health, for starters. But with our strong partnerships with K&W and Golden Corral and hard work from qualified partner agencies, we are now able to provide select feeding sites hot, prepared meals. At these sites, chicken and rice replace the PB&J, and smiles replace groans in the lunch line. The kids at W.A. Foster wait patiently in line, scoping out the trays of food in front of them. A small boy holds out his plate, his hands too small to support the weight of big helpings of chicken, rice, vegetable stir fry, and orange slices. An older boy walks over to help him carry it to the table. They both excitedly sit down and dig in. It sure is. And it’s not just the fruit. At all the feeding sites in Goldsboro, this partnership with K&W is very well-received, according to Natalie Stewart, the Summer Food Service Program Assistant at the Food Bank. She says the baked spaghetti in particular is a big hit. And it helps the Food Bank, too. These restaurants prepare the food and often transport it to the summer feeding site. Then, after lunch, they pick up the trays and utensils, wash them, and get them ready for the next day. This partnership saves us time, gas, and other transportation costs. Furthermore, because the food is prepared and either delivered directly to or picked up by coordinators of the site, it saves space in the Food Bank’s distribution centers, making room for more food to be stored. So far this summer, K&W and Golden Corral have proven to be tremendous assets to the Food Bank, our partner agencies, and the kids we serve. 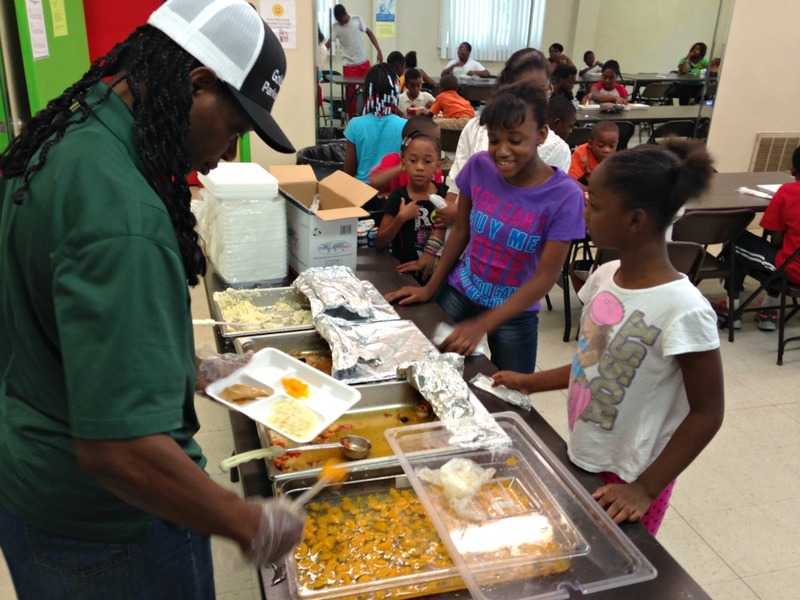 “They have a real heart for what they’re doing, and they do everything they can to make sure this program is a success,” said Natalie Stewart, Summer Food Service Program Assistant. But even beyond the successes and perks for the Food Bank and our partners, the thing to remember here is, for these kids, the baked spaghetti is more than a satisfying lunch. For them, it’s a quality, home-cooked meal, even while they’re away from home. It adds variety to their diet. It brings a smile to their day. It’s something to look forward to, which is something we all take for granted from time to time. 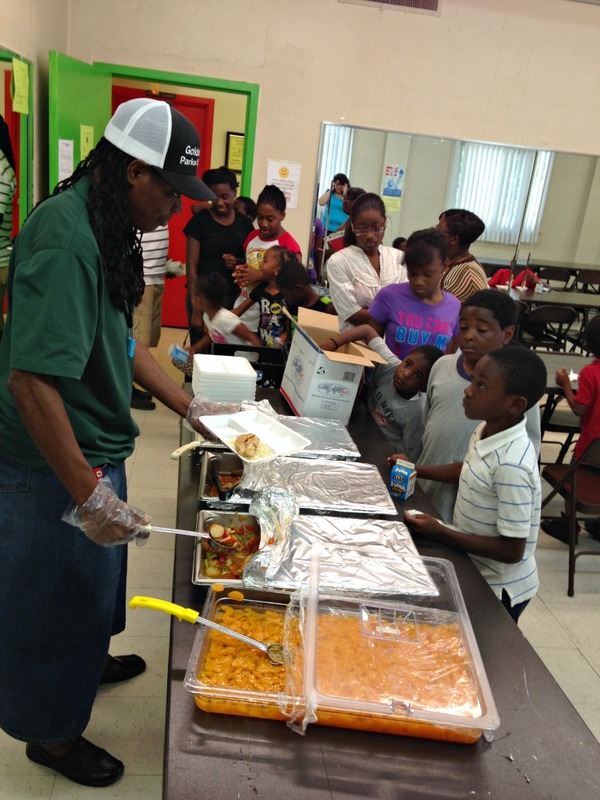 So yes, a hot meal at lunch is seriously a big deal for the kids we serve, and we thank K&W Cafeterias and Golden Corral for making it possible!